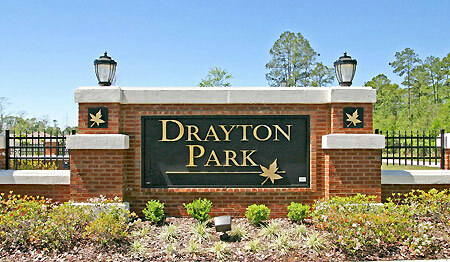 Drayton Park townhomes in Jacksonville, Florida. Nestled within breathtaking grand oaks and magnificent magnolias, Drayton Park is a gated community with 290 residences built in 2003 by Pulte Homes. Enjoy a low-maintenance, fully-landscaped townhome designed to take advantage of the captivating views of the surrounding nature. The Grove at Drayton Park offers two floor plans and The Hammock features three floor plans with attached one car gargages, each ideal for both sophisticated entertaining and casual living. Combine Pulte Homes' outstanding reputation with home ownership in the Tinseltown area and the result is a one-of-a-kind opportunity. Enjoy resort style aminities including gated entry, clubhouse, swimming pool, fitness center, car care center, community mail cluster, visitor parking spaces, walking trails and nature preserves. Trash pick-up day is every Wednesdays and irrigation scheduled on everday Thursdays. Drayton Park is conveniently located near shopping, dining, entertainment, hospital, business parks, schools, downtown and area's hottest beaches. The Biscayne features an oversized kitchen leading to a covered lanai, generous great room and dining area--ideal for entertaining. The San Carlo features a one-car attached garage, a gracious- sized family room that leads to a private covered lanai. An adjoining dining area, stylish kitchen, and breakfast nook complete the spacious and open downstairs living area. The Owner's Suite includes a large walk-in closet and tiled bathroom. Vaulted ceilings in the two bedrooms accent the home's inviting design.